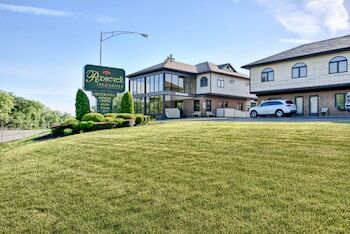 Located in Ballston Spa, Roosevelt Inn and Suites Saratoga Springs is in a rural location, within a 10-minute drive of National Museum of Dance and Saratoga Spa State Park. Featured amenities include a 24-hour front desk, a safe deposit box at the front desk, and an elevator (lift). Free self parking is available onsite. With a stay at The Brunswick B&B at Saratoga in Saratoga Springs, you'll be within a 10-minute walk of Congress Park and Saratoga Race Course. Free self parking is available onsite. With a stay at Top Hill Motel in Saratoga Springs, you'll be within a 5-minute drive of Saratoga Spa State Park and Saratoga Automobile Museum. Free self parking is available onsite. Located in Saratoga Springs, The Nest on Saratoga Lake is on a lake, within a 15-minute drive of National Museum of Racing and Hall of Fame and Saratoga Spa State Park.